We turn quickly into the parking lot before almost getting onto route 130. Sitting off route 73 in Pennsauken, NJ, the giant big box store structure didn’t exactly scream brewery. Bright blue, it still bore the outline of block letters stripped down some time ago: Spa Fitness. It was early this past Saturday morning and Drew Perry was taking time out of his busy schedule to give me a tour of what will be Double Nickel Brewing Co. It took myself, a photographer, and his 6 month old son about 17 minutes to reach the soon-to-be functioning brewery from South Philly after going over the Betsy Ross Bridge. Unsure as to if we had the right place, confirmation came as I caught sight of a few massive fermentation tanks gleaming in the distance within the now hollowed out former gym. “We demoed the whole place. All the walls. It was just an open warehouse when we started. I’ll show you the pool in a second,” Perry says with a bit of a smile. 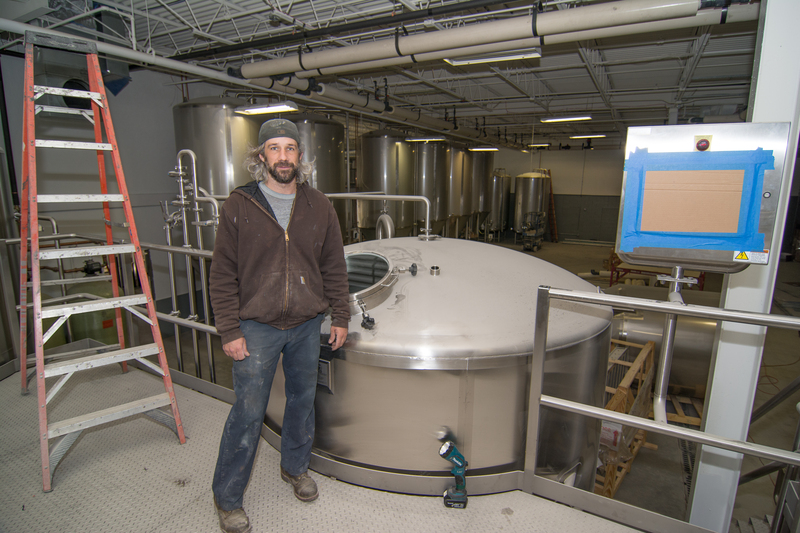 “Obviously, the glass wall wasn’t here,” he adds, referring to a 15ft pane looking into the business part of the brewery where 6 fermentors stretch to the 20ft ceiling and a three tank brewhouse is visible off to the right. Demo work started in August. The finer points had to wait until around Christmas due to the wait for framing, electrical, and plumbing permits. We’re standing in the massive tasting room within the 22,000ft building. With a targeted production launch of early June, the tasting room is set to hold a 40 person bar and space for tables to accommodate 80-100 people—and there’s enough room overhead on this side as well for phantom grunts and groans to jump up and up before bouncing back to you as you try one of the five beers Perry is starting out with. And the staircase and landing off to the left? “The mezzanine is the only thing we left intact. I think it was hot yoga or something,” he says. That upstairs space will be used for overflow from the tasting room (or perhaps more hot yoga), while the space in the corridor below will be used for private tasting. For Perry, a current Fishtown resident from South Jersey, starting Double Nickel is the next step in an already impressive brewing career that saw him work his way up from the bottom. “I got my start on the bottling line,” he says of his first job with Flying Fish Brewing back in 2006. His interest in better beer started in college at Ursinus, where him and his friends pooled money for sixes of Sierra after realizing “we’re better than Natty Lite”. “We thought we were being fancy,” he says with a laugh. Having grown up in a wine family, he says he had an appreciation for things with richer flavors.